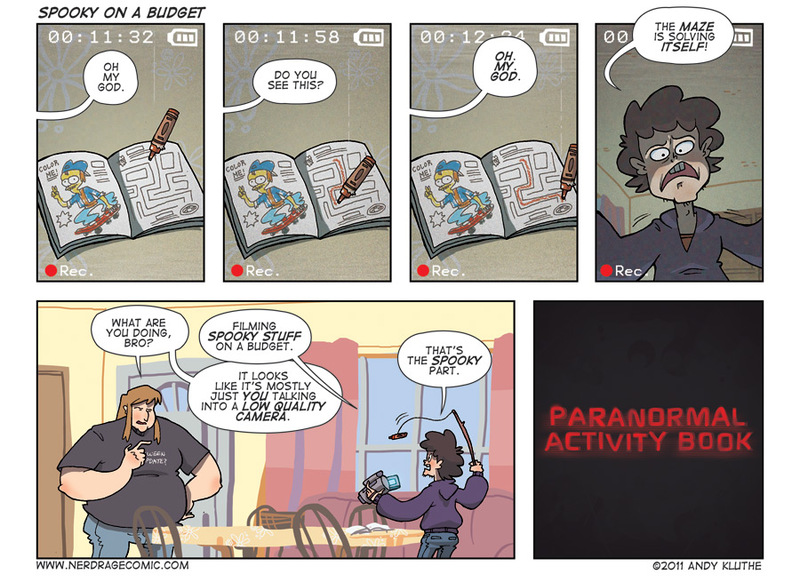 I wanted to do something Halloween related this week, so here's a strip about Paranormal Activity. I haven't seen the second or third film, but if the first is any indicator they're a prime example of Hollywood's realization sequels can be milked out of a low budget horror film. Only there's more grainy night-cam footage and less bear trap torture devices. I was actually disappointed by Paranormal Activity; it had been hyped as very scary by friends. Maybe it was over-hyped. Or maybe it's just the fact the major scares were in the trailer. Anyway, my point is that I wasn't scared by Paranormal Activity. This marks the 50th Nerd Rage strip. This webcomic has been in production regularly for over a year now. I was going to do something a little more traditionally Nerd Rage-y, but opted for a Halloween strip this week. To be fair, since this comic was never planned as an ongoing event, there are several strips mixed in that I didn't originally consider Nerd Rage strips. The count is technically off. The first image of the Phoenix Wright movie has been released. The trailer will premier on November 5th. Maybe it will capture the spirit of the game. Or maybe it will be another movie with bad acting an 90s-quality CGI (no, seriously, has anyone else noticed that Japanese movies have terrible CGI? ).